Nocturnal is proud to celebrate Indigenous women with a July line-up inspired by this year’s NAIDOC theme, ‘Because of Her, We Can!’ Featuring some of this country’s most exciting and formidable performers, the program is headed-up by the enigmatic Thelma Plum, joined by rhythm ‘n’ blues tour de force Mojo Juju and pumped up by genre-defying rising star Kaiit. DJ Sovereign Trax will heat the dance-floor with a set highlighting First Peoples artists. Beguiling, forthright and capable of casting a spell on audiences, award-winning singer-songwriter Thelma Plum has built an impressive national following since her breakout EP ‘Rosie’ in 2012. 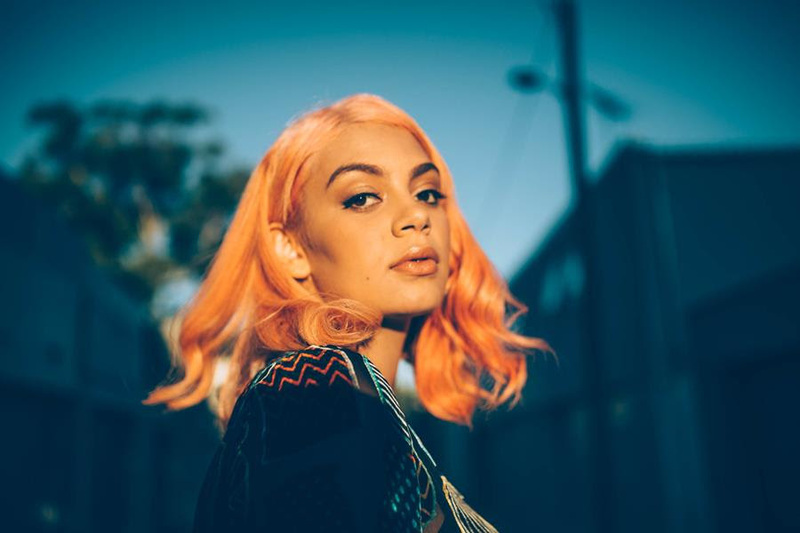 The triple j favourite spent 2017 recording her debut album between New York, London and Sydney, which fans can expect a taste of later in the year. At her Nocturnal debut, Plum will draw on the brave, dynamic sounds of her ‘Monsters’ EP. Thelma Plum will raise her voice proudly in support of all indigenous women, as she so often does. Genre-defying, fragile, ballsy, ambiguous and raw. Mojo Juju has been called many things and yet she is forever hard to define. By her own explanation, Mojo has never felt comfortable with being categorised, and is increasingly deliberate in avoiding labels and defying genres. As a result, it is only in experiencing her live shows that one can begin to understand the full breadth of this dynamic artist. Expect a fearless display of expert noise-making that will rattle you right down to your bones. Blessed with an enchanting voice that crosses musical boundaries, PNG-born Melbournian Kaiit’s love of jazz and neo-soul is evident in her music, drawing upon inspiration from her idols Amy Winehouse, Lauryn Hill and the contemporary sounds of Noname Gypsy and SZA. Kaiit’s artistic background in both beauty and fashion is apparent in her inimitable style and edgy aesthetic. A fearless new talent to watch out for. Supporting these incredible live performers, DJ Sovereign Trax will curate an excellent selection of tracks designed to decolonise our musical horizons. Prepare for a mind-expanding experience that brings First Peoples artists to the front. This July edition of Nocturnal will also educate. Jane Harrison (Muruwari) of Blak Writers is curating a side-stage devoted to poetry, spoken word and storytelling. Hear directly from Koorie and Aboriginal and Torres Strait Islander women writers. Until 8.30pm, Museums Victoria’s First People’s, Conservation and Sciences staff will host expert talks. Revelers can also explore a brand new exhibition in Bunjilaka Aboriginal Cultural Centre launched for NAIDOC week: ‘Because of Her, We Can!’. Shining a light on twelve Victorian First Peoples women who have achieved extraordinary things, objects on display will include a series of digging sticks, traditional women’s tools, which are housed in Museums Victoria’s collection. ‘Because of Her, We Can’ also provides valuable background information about the important history of NAIDOC. Explore the entire Museum with galleries open till midnight, including You Can’t DoThat (presented by the Virgin Australia Melbourne Fashion Festival), an exploration of Australian fashion which has defied convention. Designers such as Stella Dare, Prue Acton, Christopher Graf and Jenny Bannister are all spotlighted, along with trailblazing models Yorta Yorta and Wunrundjeri woman Lois Briggs (now Aunty Lois Peeler).